to wash off the starch. Drain, place in a large pan, then cover with cold water. Add 2 rosemary sprigs, 6 thyme sprigs and 2 bashed garlic cloves. Bring to the boil, then simmer until very soft and starting to crumble (about 25–30 minutes). Drain carefully; leave to cool in the colander. 2. 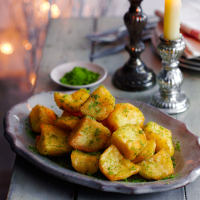 Put the beef dripping and olive oil in a roasting tray large enough to hold all the potatoes in a single layer. Put in the oven for 15 minutes (once melted, the fat should come about 0.5cm up the sides). Add the potatoes to the tray with the remaining garlic cloves. Stir to coat in the oil and place back in the oven for 1 hour, gently turning every 20 minutes. 3. Meanwhile, to make the herb salt, grind the salt, sage leaves, rosemary leaves, thyme and juniper in a spice grinder or mortar and pestle to a fine powder. 4. After 1 hour, add the remaining rosemary and thyme to the potatoes; return to the oven for 20-30 minutes or until the potatoes are golden brown and crispy. Drain on kitchen paper; season with 4 tsp herb salt before serving. This recipe was first published in Tue Dec 03 11:54:00 GMT 2013.